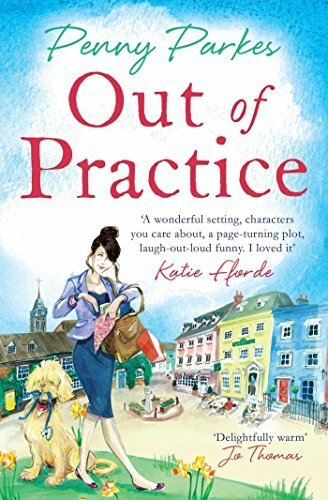 Meet married mum of two and successful GP Holly Graham as she relocates her family to join the team at The Practice at Beckerford, hoping to find the peaceful life she craves, despite the chaos that comes with her two year old twins and the troublesome state of her marriage. It will certainly be a challenge to keep her private and professional lives separate in such a tight-knit community. Her colleagues have their own issues to contend with. The gorgeous Dr Dan Carter is struggling with to focus on work and the last thing he needs is any more stress; having his ambitious ex-girlfriend Dr Julia Channing working alongside him isn't really helping. Thankfully, the rather delectable Dr Taffy Jones is on hand to distract Holly from the escalating situation at home. If you have ever watched BBC medical soap opera Doctors, then you will have a good idea of the sort of place Larkford is, and more specifically The Practice. It is a GP surgery that forms the heart of the community, and I loved reading about the various ailments the patients came in with and the way the doctors dealt with them. Holly is in a miserable marriage and has two year old twin boys, they make the move to Larkford so she can have a new job and better quality of life, than when she was working in a hospital, and it isn't before long she makes her mark on the surgery and the community. Her best friend Lizzie already lived in the town, as did Lizzie's cousin, the dishy Dr Dan, who is an instant ally for Holly. The other Drs and members of staff in the surgery are a complete mix of personalities, from the money grabbing doctor, to the stand offish, to the pretty much germphobic pharmacist! Elsie Townsend was definitely the best character, she is in her 80s and keeps the doctors on their toes as they try to work out if she is acting, just being herself or if old age is starting to creep in. She is a breath of fresh air to the whole book, and is makes a very dear friend in Holly, while imparting her words of wisdom. There is a theme in the story, about whether you should always bow down to the word "should" rather than even occasionally listening to your inner voice about doing what you want to do. This is one of Elsie's teachings, and one that really affects Julia and Holly's lives. My overwhelming feeling about Out of Practice was that although the writing was really good, and the I was really getting a great sense of Larkford, and the Practice, as well as the various characteristics of the people, is that the book felt far too long. It seemed as though no matter how much I was reading, the percentage bar wasn't filling, and there was a lot of story. That being said, I truly think that this is a promising debut novel, and that I would love to see a return to Larkford, and The Practice, as the author definitely knows her medical writing. Thank you to everyone that overwhelmingly voted for Out of Practice this week. I'd had the book since the Spring Blogger Event earlier in the year, where I did get to meet Penny Parkes and had my paperback copy signed. As I was reading the first chapter, I could hear Penny's voice in my minds ear as she had read some of the first chapter for those of us present. As a result I'm very glad I finally had a chance to read this, and hope you will all whatever this weeks selection is on my new Rachel's Reads Randomly vote.